I told you last week that I've seriously caught the Christmas bug, and I meant it. This weekend we braved the crowds (they are already huge everywhere!) and bought our Christmas lights. Sorry this photo is so blurry, I guess that's what happens when I try to take a cheery Christmas picture at night. You can see my Christmas tree all lit up inside and the multicoloured lights outside! I love it, our house is cute, festive and fun. We also have a nice red berry wreath on the front door, but this sad picture doesn't show it. Maybe I'll be able to get a better picture another day when there's some snow on the ground. I've got more things to show you but ran out of light today before I was able to take any photographs. I've made lots of progress on my baby blanket, found the perfect buttons for my playful stripes cardigan, took a fun lace knitting class with Anne Hanson this past weekend, I also have a scarf and a hat to share... don't worry, it won't be all Christmas craziness around here this month, I've got lots of knitting going on too! After a wonderful week away in Vancouver I am back home, back to work and back on track. We are super busy, working away all day, however despite all the important work things that I need to be doing I am now currently totally obsessed with getting organized for Christmas! 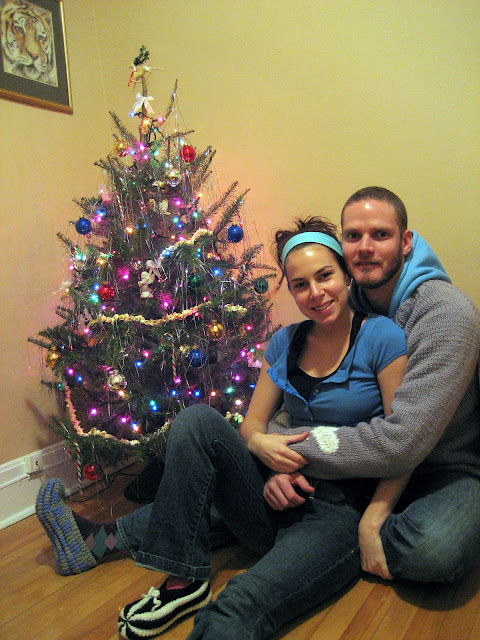 We even got our Christmas tree last night! I am beyond excited about it. After much deliberation we decided to go the artificial route, my family switched to an artificial tree years ago, so I don't have the same nostalgic connection to real trees that many people have. With the artificial tree, we can re-use the same tree year after year, we can put it up early and leave it up late if we want to because there is no risk of it dying, and my favorite part is that you can bend and manipulate the branches to easily hang ornaments in every single spot on the tree. So, our tree is up! I am so excited to have our own house and our own Christmas tree! Chris and I put up a little Charlie Brown Christmas tree in our first apartment the first Christmas we lived together, (and that little number cost us around $25, so going the artificial route we'll definitely save money in the long run) but since we always spend Christmas with our families at our parents houses we haven't felt the need to put up our own tree for the past couple of years. Even though our tree isn't decorated yet is already feels so warm and festive! We don't have many ornaments, but I have plans to make some this year, which I'll fill you in on once I get that ball rolling. We also have to put up our outdoor lights, I'm getting all giddy just thinking about the holidays! I may not like Halloween, but I love Christmas! While I was in Vancouver I got a bit of Christmas knitting done. 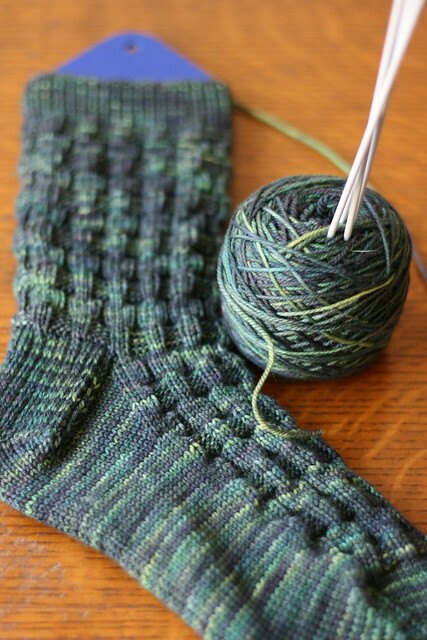 I knit one sock for my dad in Anne Hanson's Cinder Block sock pattern in TFA Purple Label Cashmere sock yarn in Olive. I also started (and am now close to finishing) a Just Enough Ruffles Scarf for my mother in law in TFA Purple Label Cashmere sock yarn in Poppy. 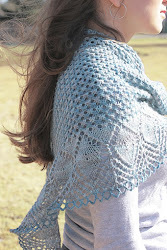 I'm knitting this with two strands of yarn held together and it is so delicious! Thick and soft and red luxurious. She's gonna love this! And though this last piece isn't for Christmas, it is gift knitting; I have a friend expecting a baby girl in February and her baby shower is at the beginning of December. Last night I went through my DK weight scraps and picked out all the pink and purple leftovers and cast on for a simple baby blanket. 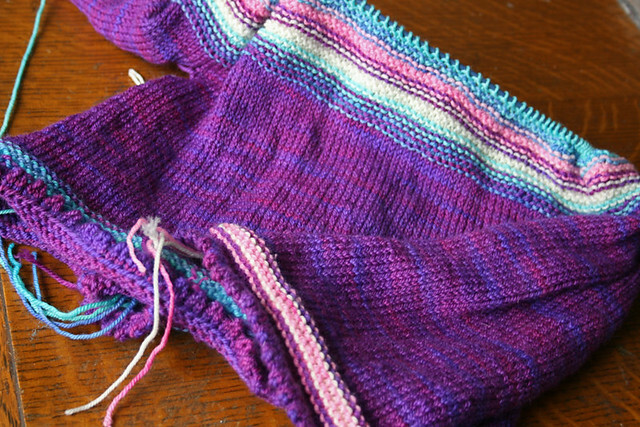 I'm really hoping that I can finish this in time, it may be very simple knitting, but it's a lot of knitting! I'm hoping that Chris can help. 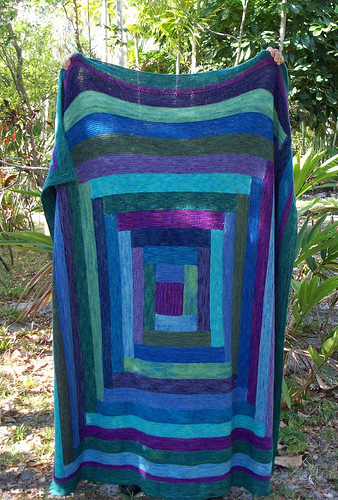 I'm planning a wonky log cabin style blanket that turns out something like this. Hello all! I'm back home after having spent a great week visiting with my brother in Vancouver. It's a beautiful city and I love my brother, but I am happy to be home. I am definitely a creature of habit. 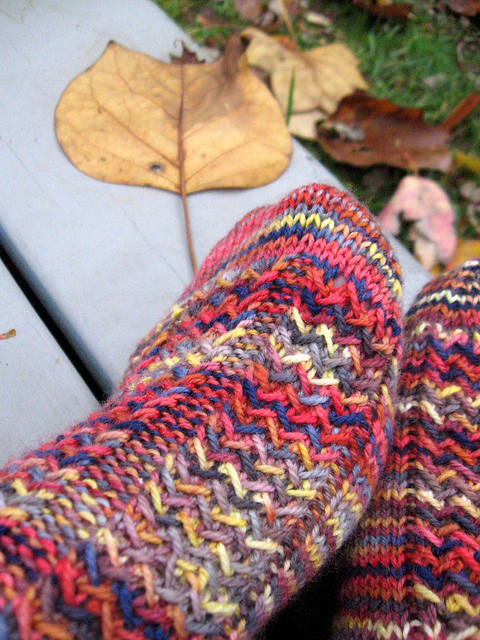 I am very happy to be at home, with my yarn, dyeing, sorting, labeling, shipping... working. It's the best thing in the world to love your job as much as I do. Anyways, back to today's TFA Tuesday. 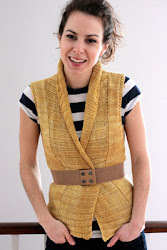 This week I'm featuring this beautiful short sleeved cardigan by 1morerow (blog, Ravelry profile). This pattern was improvised, has short sleeves, a textured yoke, garter stitch, stockinette stitch and eyelet rows that look like stars, what more could you ask for!? Oh, I know, how about luxurious softness? Well, this sweater has that too, it was knit in TFA Purple Label Cashmere Sock yarn in Cobalt. Yum. Layering pieces like this are always a welcome addition to just about any wardrobe. And since it's knit at a finer gauge, it only took 2 skeins of yarn. Nice work! Hello all! I'm still in Vancouver, about half way through my week long trip out West to visit my brother Vince. He's out at a triathlon meeting tonight so I thought I would take the opportunity to pop in and say a quick little hello. Unfortunately this will be a photo-less post, I know, I'm sorry, I hate no-photo posts too. I have taken some pictures but it has been really rainy out here and the shots I've taken just don't do this gorgeous part of the world justice. Vancouver is breathtakingly beautiful! Vince used to talk about how gorgeous it was and I would roll my eyes and get defensive and tell him that our good old East Coast was beautiful too, but now that I've seen it with my own eyes I can honestly admit that it's just not the same. The mountains, the water, everything here is just so incredibly massive and overwhelming that it's hard not to get a little short of breath when admiring the scenery. Vancouver is great, I'm having a wonderful time with my brother, I miss him when he's thousands of kilometres away. I've knit a sock and I plan on making a good dent in the second one before I get home. I also brought yarn to cast on for a scarf for my mother in law. Life is good. 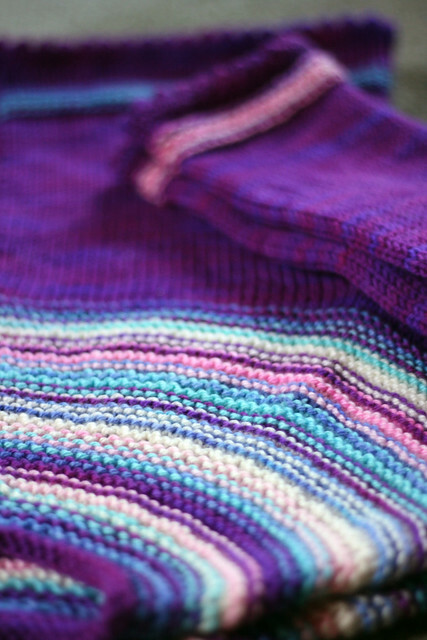 I finished knitting my Playful Stripes cardigan last week. The second of what will hopefully be three knitted sweaters for the kids in my life this Christmas. This sweater turned out beautifully, but a little bit Easter-Eggy. I'm not saying that as though it's a bad thing necessarily, it's just a pretty distinct combination of bright jewel purple and light pastels. I said I wanted a perfectly girly, fun and pretty sweater and that's definitely what I got! 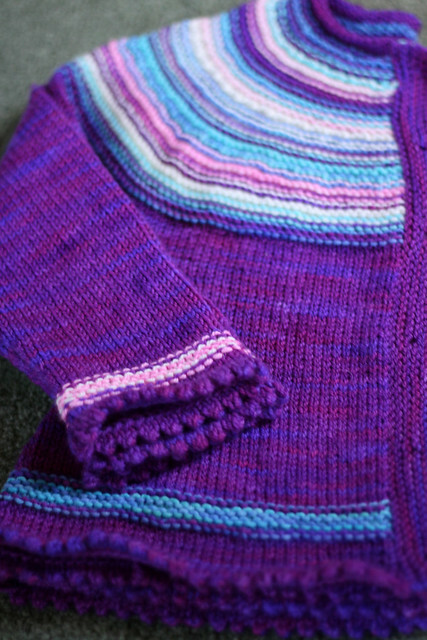 A couple multicoloured buttons and this sweater will be ready for gifting. You may not hear much from me this week. I'm leaving for Vancouver bright and early tomorrow morning to spend a week with my brother! He's been living there for over 3 years now and I shamefully haven't been out to visit him once, we both figured it was about time I fix that! Have a great week! Hope it's full of knitting! Mary-Louise! She shared that her favorite colours are blue and green, which is lucky for her, because this pretty skein of blue/green (and yellow and brown...) yarn is headed straight to her! Mary-Louise, I've sent you an e-mail, as soon as I hear back with your address this skein will be in the mail to you stat. This was a fun giveaway, I love hearing what everyone's favorite colours are. Looks like I'm not alone in the blue department, but there are also a lot of red/orange/brown fans out there! I will definitely keep that in mind as I dye future colourways. Chris and I gave ourselves a little bit of time yesterday afternoon to play around with new one of a kind colourways for the Etsy shop. I am very happy with the results. 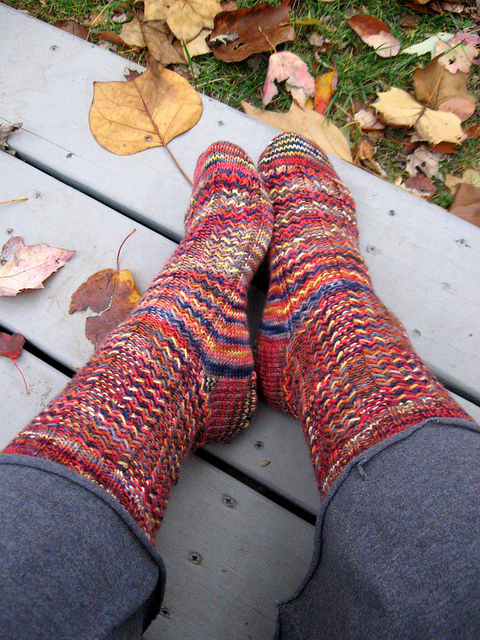 Almost too happy, I am having a very difficult time parting with some of my precious one of kind skeins. Chris had to give me a pep talk this morning to convince me that it was the right thing to do. I gave in and listed them in the shop, but not before putting up a fight! These three skeins of deep, dark black/turquoise cashmere sock are among my favorite, I just hope that they end up in a good home! We are all Anne Hanson fans right? Great designs, great blog, just great overall! 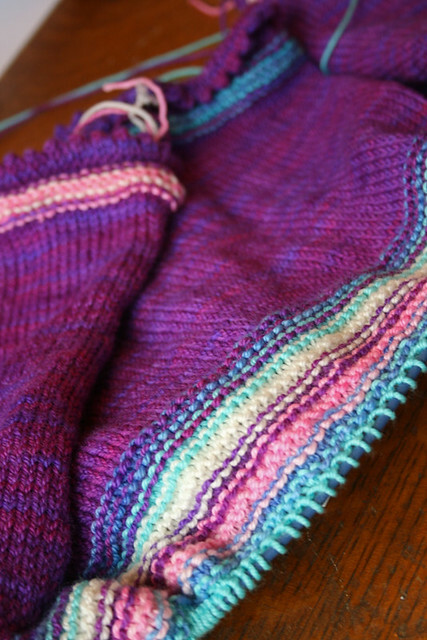 Imagine my delight when I found out that she was designing a pair of socks in my Purple Label Cashmere Sock yarn! Voila the Cinder Block socks (on Ravelry), designed by Anne Hanson in TFA Purple Label Cashmere sock yarn in the Shadow colourway. 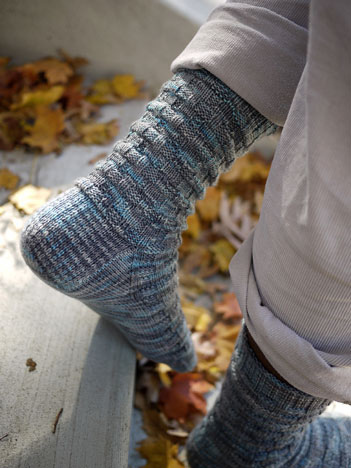 These socks are the perfect combination of comfy and attractive, interesting but not too busy for tonal yarns, pretty yet completely gender neutral. 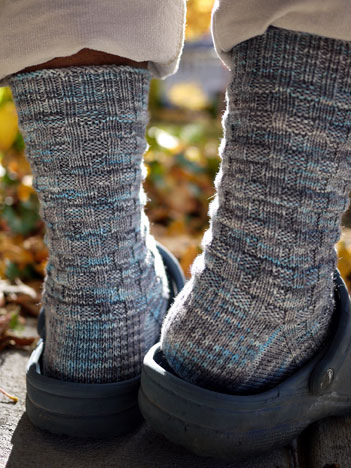 I knit my dad a pair of socks for Christmas every year, and I think that this year I will be knitting him Cinder Block socks, he will LOVE them! Wouldn't you? Now I have to pick just the right colour... but they look so great in shadow, I'm thinking of pushing dad's limits and going with something still manly but with a little more kick like Cobalt or Mallard, maybe even Teal! One of a Kind Etsy shop and a GIVEAWAY! It's been almost a year now since I launched my own website. Before that I was on Etsy, and though I LOVE Etsy it does have some limitations. A year later and my website is still running smoothly and going strong, however I'm missing the flexibility that Etsy offers for limited quantity products. Anyways, a roundabout way of saying that I have re-launched my Etsy site to feature all kinds of wonderful One of a Kind skeins of yarn. I've got several boxes of yarns that I selfishly stash away for my own personal use. Chris and I both love to take a day off once in a while from dying our permanent collection colourways and experiment with new ones. Sometimes they work out perfectly and fit into my grand plan for the collection and are added to the repertoire. Other times they are lovely and perfect but just don't quite fit in to the TFA scheme. These are the precious skeins that I hoard away. Sometimes I give one or two to my mom or sister, but most of them I end of saving for myself! I have so many and there is no possible way that I could knit them all, so I've decided it's time to share. That's where the Etsy site comes in. I'll post One of a Kind colourways as I make them in very limited quantities, batches of one, two or three skeins, mostly in sock yarn because that's what I experiment with the most, and hopefully there will be some TFA fans out there who like the thrill of knitting with yarn that is absolutely One of a Kind! I've also listed the Kits on the Etsy site, because kits are fun! I will also be adding rovings and other yarn bases as I dye them. I'm really looking forward to having the freedom to be as creative as I want to be! Crazy yarns, subtle yarns, whatever I feel like. No rules, just pretty yarns. So, that brings us to the part in the post that you've all been waiting for... the GIVEAWAY! I'll be giving away one skein of this lovely green, yellow, brown yarn called Spring to one lucky commenter. To enter, simply leave a comment telling me your favorite colour and be sure to include your e-mail address so I can get ahold of you should you win. I will announce a winner next Saturday. Good luck! As soon as I finished knitting my first kids Christmas sweater of the season, I immediately cast on for a sweater for the next little on my list. She happens to be child #1's sister. This little girl is my god-daughter and one of my favorite people to knit for! She will be 5 years old in December and was Tinkerbell for Halloween this year, to me, that means that a sweater knit for her needs to be perfectly girly. Pink, purple, rainbow, picot-edge, pretty buttons, the works! For a second I considered knitting her something more unisex, a sweater that she could pass on to her little brother when she outgrew it, but then I thought "Hey! You're only a 5 year old girl once, better make the most of it!" So this sweater is decidedly girly and sweet, possibly too sweet what with the pastels and the bright body, but hopefully a Tinkerbell loving 5 year old girl will like it. 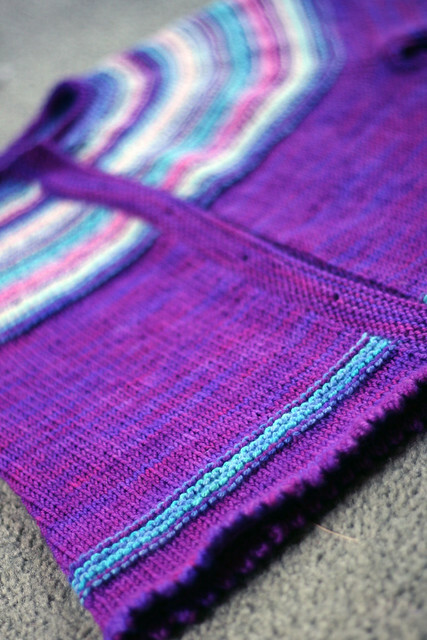 This is Nevernotknitting's Playful Stripes Cardigan. A really simple, perfect little girl sweater. The hardest part about this sweater is choosing your colours. 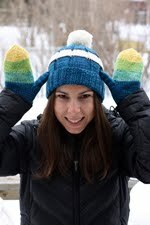 I knew that I wanted to knit it in Jewel, but picking the contrasting colours was a real challenge! After much deliberation I decided to go with lighter, softer colours instead of making the whole thing in the brightest, boldest colours I've got, I hoped that the softer contrasting colours would help to tone down the overall effect and result in a pretty, girly sweater without being too in your face. I think its working! 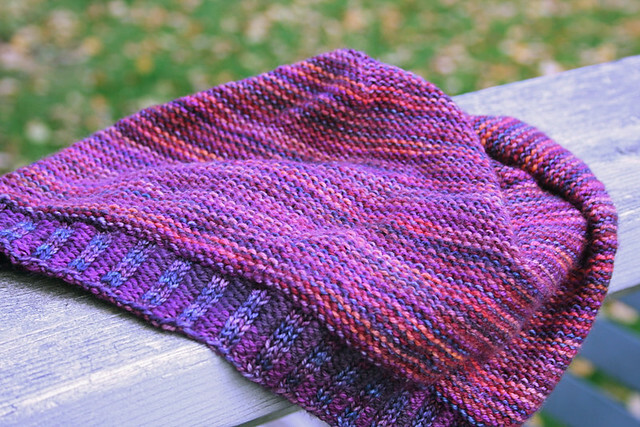 This is TFA Yellow Label DK Weight yarn in Jewel, Ultraviolet, Seabreeze, Sweetheart and Natural (undyed). 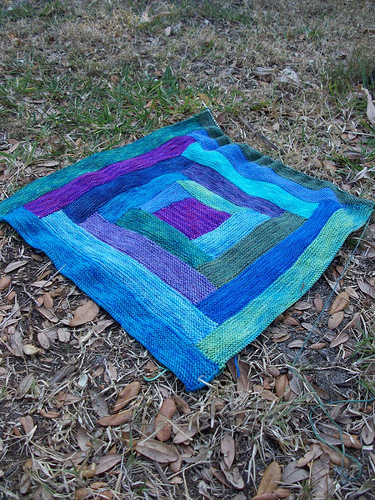 This week's TFA Tuesday knit is an absolutely stunning log cabin blanket knit by flamefingers. I love log cabin quilts so it stands to reason that I would also love a knitted log cabin. Not long after I started selling my yarns online, I got an order from a lovely customer for all the colours pictured below. 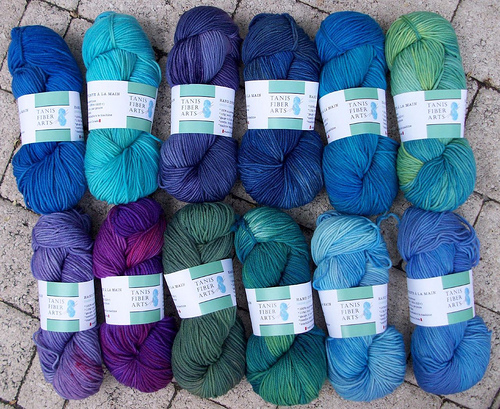 I was beside myself excited about it, not only was it a big order, but it was hands down, totally one of my favorite colour palettes, in fact, the palette is very similar to the colours I chose to knit my first TFA blanket in, my Baby Shane Blanket. This is such a great pattern. 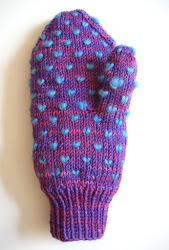 On her Ravelry project page, flamefingers refers to it as potato chip knitting! 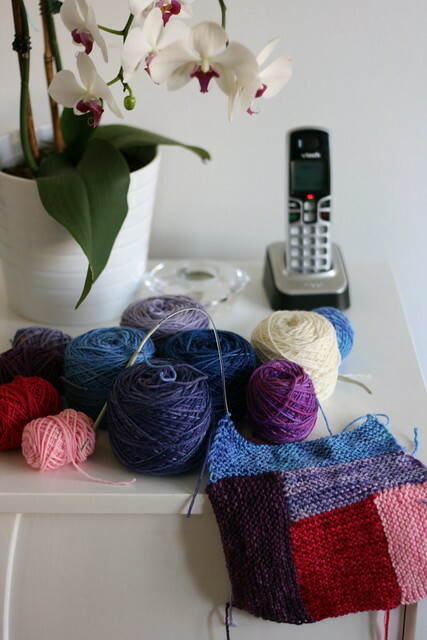 Just miles and miles of lovely, squishy garter stitch striping your favorite colours as you please. 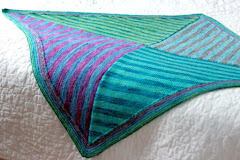 This pattern is so versatile, you could keep all the stripes the same width like flamefingers did, or you could change the width as you please and achieve more of a crazy quilt look. 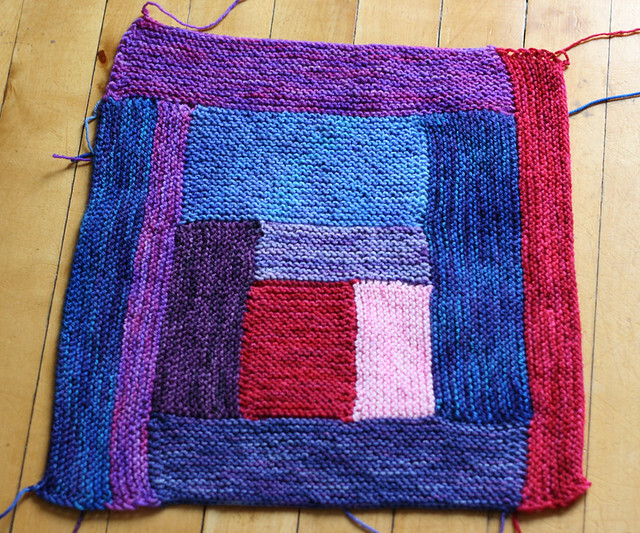 You could make one big block, or seam several small blocks together... the possibilities are endless! Especially when it comes to colour options, just the thought of all the beautiful palette possibilities is enough to make me a little dizzy! 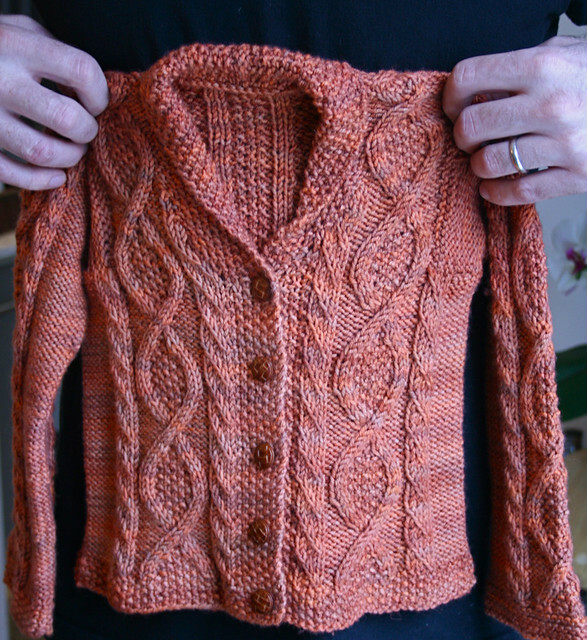 I sewed the buttons on my little Amber Trellis sweater yesterday. This sweater is very, very cute. 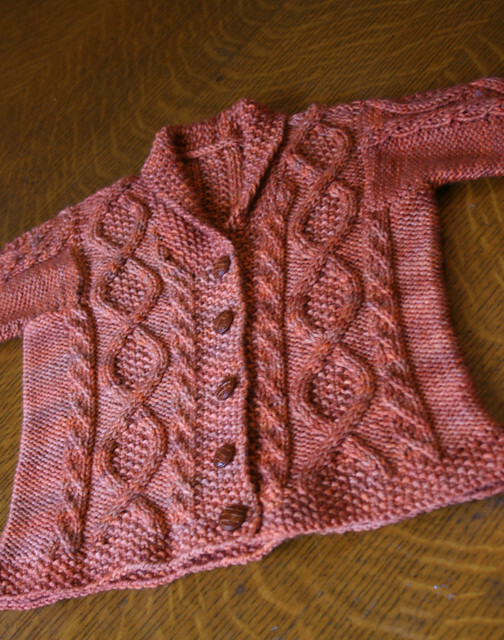 What could be sweeter then a two year boy old wearing an old man cardigan? I love it and can't wait to see this little sweater on the little boy who will be receiving it this December for his birthday. 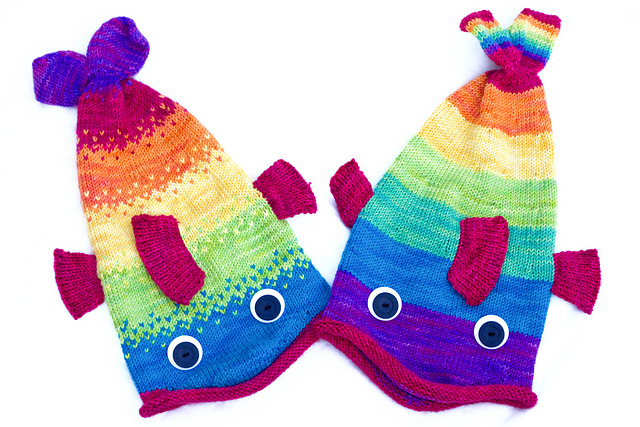 I love knitting for kids, their knits are so often small, cute, quick and colourful. 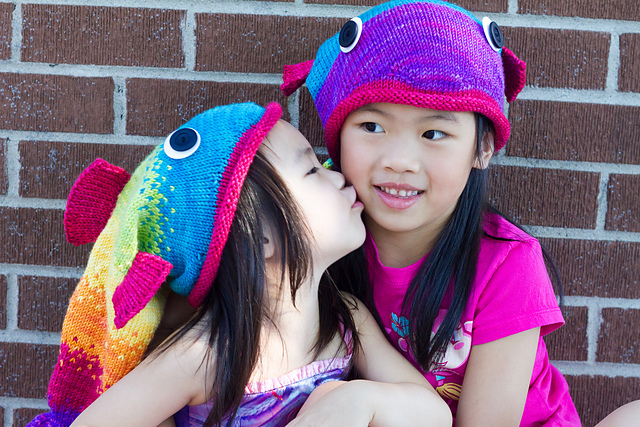 I have three special kiddo's in my life who will all receive hand knits from me this holiday season. I chose to knit this sweater in Amber because I thought that it was a very boy friendly colour, and that t would look smashing with brown corduroys (when I was a kid I wore A LOT of corduroy's and turtlenecks... is that still the case?) I also find that Amber has a real vintage quality to it, it's not as bright and fresh as a lot of my other colourways, but in a good way! It's a brand new sweater, but with an old fashioned, classic look. I picked this warm brown faux-leather buttons to add to the old-school style. 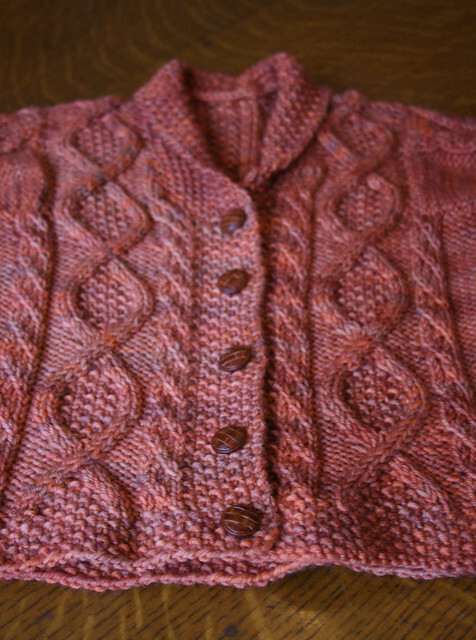 This sweater is lovely, and though I did enjoy knitting it, I did not enjoy all the sewing up when I was done. 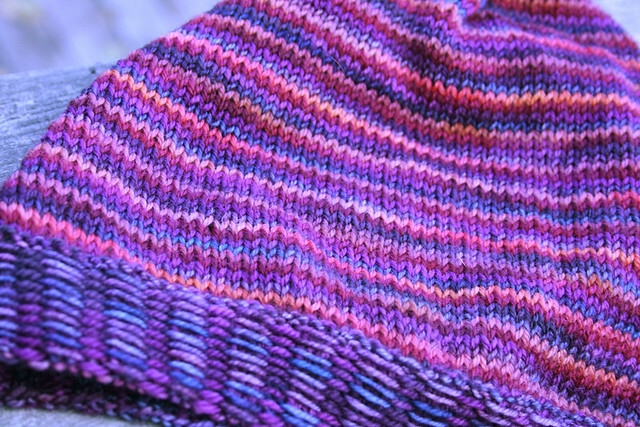 There was an awful lot of finishing involved for such a little sweater! I did learn some new techniques though, how to do mattress stitch on reverse-stockinet, how to graft cables together, both very valuable lessons. I wasn't thrilled with the bulkiness that resulted from all the seams when I was finished, but a good blocking helped to make everything lie flat and made the seems much less noticeable on the inside. All in all, a success. I have no idea if it will fit. I always try to size my baby/kid knits on the generous side, that way, if it doesn't fit them right away, hopefully it will fit them soon and for a long time. Plus, the only thing cuter then a 2 year old in an old man cardigan is a 2 year old in an old man cardigan with his sleeves rolled up!